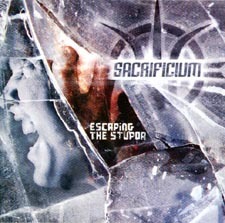 Sacrificium have been around for a dozen years yet Escaping The Stupor is only the second album. After forming in Wablingen (Germany) in 1993 originally as a thrash band, it wasn't long until they moved into the realm of death metal. It wouldn't be until 1995 that their first demo CD was released and it was followed up three years later with the Mortal Fear demo tape. But the first big break for vocalist Claudio Enzler, guitarists Ulrike Uhlmann and Oliver Tesch (who also does backing vocals), bassist Samuel Herbrich and drummer Mario Henning came when their debut long player, Cold Black Piece Of Flesh, was released by Whirlwind Records in 2002. It captured the attention of the media and things began to pick up for the group. Sacrificium moved to Black Lotus Records and the result is their sophomore effort, Escaping The Stupor. The straight up, balls out death metal assault of Canvas signals in no uncertain terms what you should expect from Sacrificium and it continues with the Carcass like twin vocal attack over the Swedish death metal influenced riffs of Towards The Edge Of Degeneration. The first real offering of groove and melody can be found amongst the brutal double kick barrage of I Am The Enemy before the lengthy Pierced By Death delivers a psychotic switch between mid-paced melody and all out chaos. What is not so much an interesting turn but more of a noticeable overtone, is the Bolt Thrower grooves and stylings that appear throughout much of the remainder of the album starting with the very distinctly Bolt Thrower like Extinction Of Mankind. Shivering mixes very definite fast picked death metal riffs between power chord driven passages before the acoustic instrumental piece, Tremendum, provides some breathing space and an opportunity to back off on the intensity for a couple of minutes. But whilst that is all well and good, its impact might have been greater if it was a little shorter. The Bolt Thrower-isms continue with the long drawn out fade in of As Silence Dies and mid-paced Relativation Of Justice before Of Traumatic Memories And Tears and Nothing From You return to a more straight up, full-on death metal approach. I guess there's a reason that it's taken so long for Sacrificium to get where they are. It's difficult to be original in the death metal scene nowadays and to a degree, there are parts of Escaping The Stupor that just aren't that original. Still, as an album overall, it might be the one that helps them move from the underground enough to allow them to make it to the next level. Escaping The Stupor is solid and enjoyable even if some of the influences are glaringly obvious at times.